Many children with epilepsy suffer hundreds of seizures each day even though they take medication aimed to curb them. It might be difficult to understand how harmful repeated seizures, albeit short, can be to a child’s development. Imagine if you were reading an article and every few seconds someone tugged on your sleeve and asked you a question. These interruptions would make it very difficult, if not impossible, to absorb the details or perhaps even the gist of that article. This is analogous to a developing brain disrupted by relentless scores of seizures. These short seizures come in various types. They can be absence seizures (petit mal) during which a person loses consciousness, though not posture, for several seconds. Myoclonic seizures cause sudden, brief, muscle spasms. Drop seizures, known as atonic seizures, are dangerous because the person experiences a sudden loss of body tone and drops to the ground, which can cause serious, sometimes fatal, bodily injury. My six-year-old son Calvin mostly suffers tonic clonic (grand mal) seizures that can last as long as three minutes. 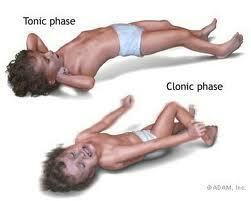 In the tonic phase he stiffens and stops breathing and during the clonic phase he convulses. I can only imagine that these repeated, uncontrolled electrical storms are frying his brain. At least a third of children with epilepsy have seizures that are not fully controlled by medication or other treatment. My Calvin is one of them. These kids experience a worsening of developmental deficits, regression, harmful side effects from drugs and even death. The only hope our children have is to find a cure. In honor of Epilepsy Awareness Month please share Calvin’s story with your friends, colleagues and families. It’s not hard, just do it one story at a time. Again, I am moved to tears by Calvin's story, which is also your story. When I took my daughter for her three month checkup (she is now 16, almost 17) I had described to her pediatrician some episodes she had where she would cry extremely hard for a few minutes and then fall fast asleep. Even as an inexperienced mother, I thought of it more as a nuisance than a medical issue. But this particular doctor, for some reason, immediately made an appointment for me to take her to a pediatric neurologist. I called my husband in tears and said, we have to take her to a specialist, I was frantic. They did an EKG and I held her while they put the electrodes on her head. Every time I see that picture of Calvin, I think of how difficult it must have been and is for you (and Michael)to experience what seemed to me to be an eternity of fear and heartache that I went through ONCE sixteen years ago. Anna was and is fine. The neurologist could see she was fine and seemed perturbed that the pediatrician was such an alarmist. I now have a 16 year old daughter who is driving and while I am consumed with anxiety every time she gets behind the wheel, I know, that chances are, she'll be okay. Calvin's future is not so certain, but looking at his beautiful face, I can tell that he is genuinely loved and how many of us can say that?